What's New? - New records and fish discoveries over the last year. 1. The most exciting discovery was Sally Polack’s finding the spotted garden eels (Heteroconger hassi) at Sodwana Bay! 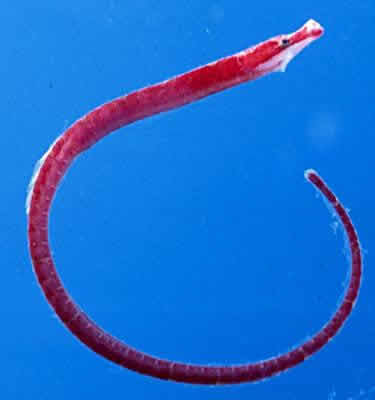 With all the diving at Sodwana, it’s amazing that no one has previously seen these garden eels. 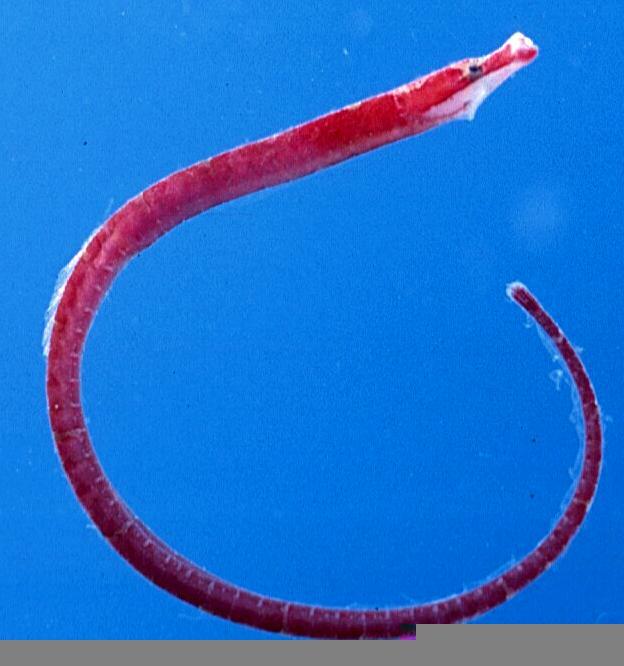 Maybe some other divers have seen them before and didn’t know that these eels weren’t reported from South Africa? 2. Lipspot moray, Gymnothorax chilospilus Bleeker, 1865 (below left); collected at Aliwal Shoal, this widely distributed Indo-West Pacific moray eel was previously misidentified as the leopard moray, G. undulatus (below right). Our moray expert (Dave Smith) says that the G. undulatus of southern Africa looks different from the G. undulatus from elsewhere and is probably a different species. 3. 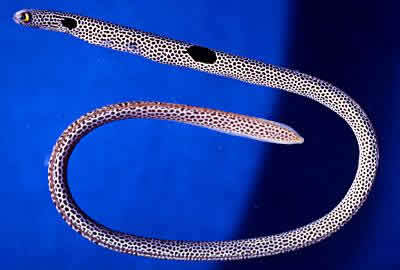 Molucca moray, Gymnothorax moluccensis (Bleeker, 1864); first record for the western Indian Ocean. 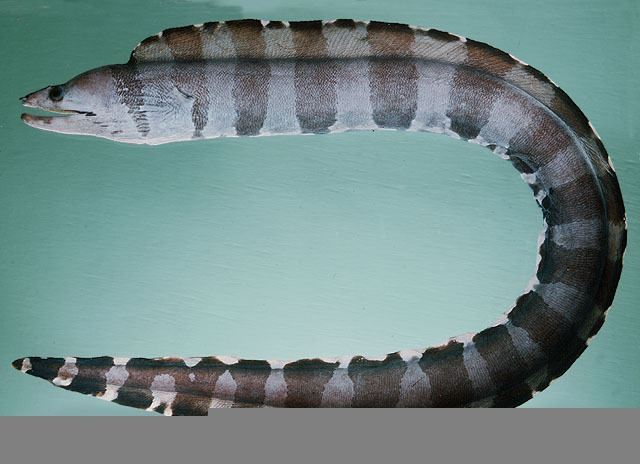 This rare moray was previously known from the Western Pacific; we collected it at Sodwana Bay. 4. Dwarf moray, Gymnothorax robinsi Böhlke, 1997; collected from the Umtata River mouth; previously known from Seychelles, Maldives, and Western Pacific. 5. Banded moray, Gymnothorax rueppelliae (McClelland, 1845); photographed at Sodwana Bay by Rose McGaw. 6. Whitespotted snake moray, Uropterygius alboguttatus Smith, 1962; originally described by J.L.B. Smith from Assumption Island in the Seychelles, this little moray was previously confused with a similar species, the yellowtail snake moray, U. xanthopterus Bleeker, 1859. 7. 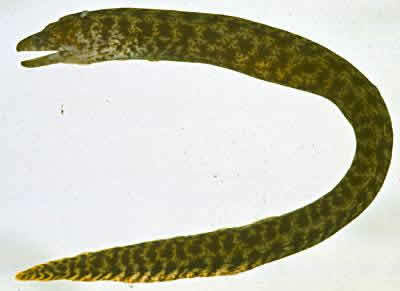 Java spaghetti eel, Moringua javanica (Kaup, 1856); collected at Aliwal Shoal, previously known from southern Mozambique to the Indo-West Pacific region. 8. 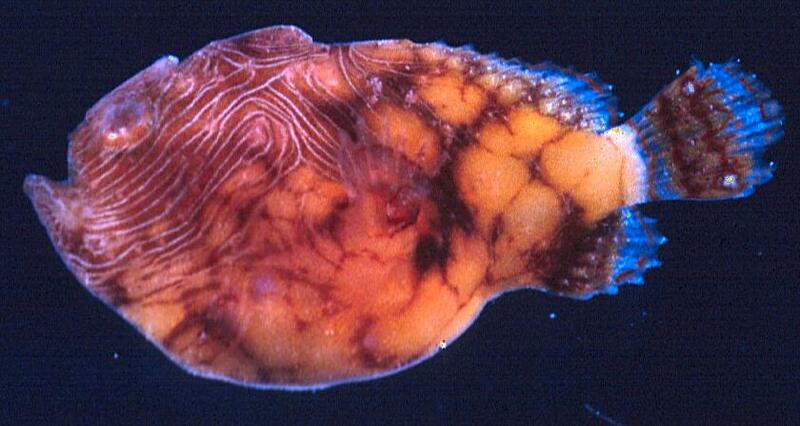 Pygmy angler, Antennatus sp, a new species collected at Aliwal, to be described by John E. Randall. 9. Slimy bythitid, Brosmophyciops pautzkei Schultz, 1960; previously known from Chagos, Maldives and the western-central Pacific. 10. Red pipefish, Festucalex erythraeus (Gilbert, 1905); collected at Aliwal Shoal, previously known from Mozambique to central Pacific. 11. 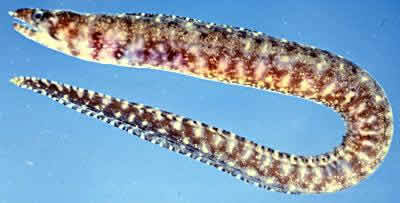 Brown banded pipefish, Halicampus zavorensis Dawson, 1984; collected at Aliwal, previously known specimens: 1 from Zavora Mozambique and 2 from Oman. 12. 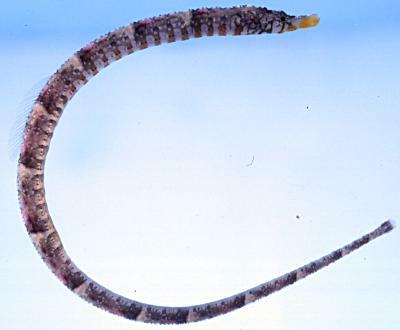 Ghost pipefish, Solenostomus paradoxus (Pallas, 1770); previously known from Zanzibar and the Indo-West Pacific region. 13. African basslet, Liopropoma africanum Smith, 1954; collected at Aliwal Shoal, previously known from Inhaca, Chagos, Comores, Maldives, and western Pacific. 14. Pinstriped basslet, Liopropoma susumi (Jordan & Seale, 1906); collected at Aliwal Shoal, previously known from Chagos, Comores, Maldives and western Pacific. 15. 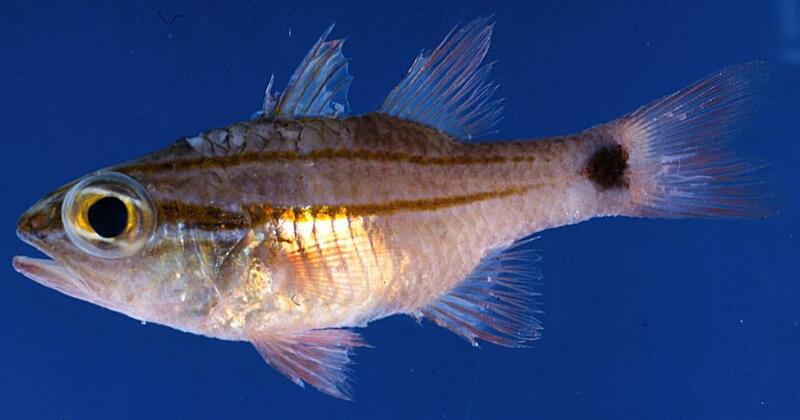 Doubleline cardinalfish, Apogon fukuii Hayashi, 1990; collected at Aliwal Shoal, previously known from Japan. 16. 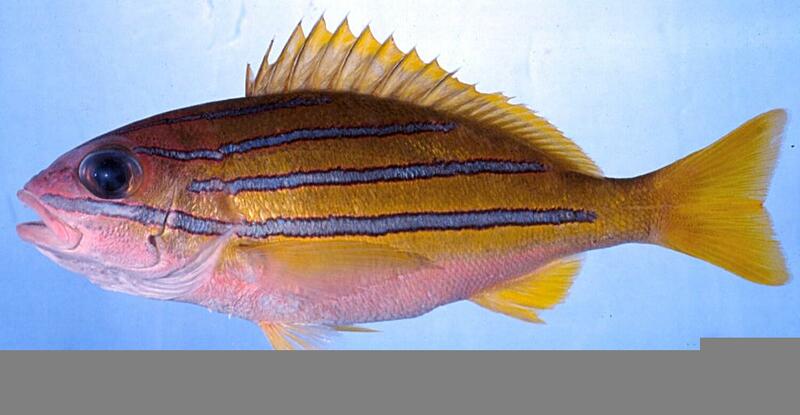 Bengal snapper, Lutjanus bengalensis (Bloch, 1790); collected at Sodwana Bay, previously known from Kenya, Mauritius, Oman to Indonesia. 17. Chequered damselfish, Chromis chrysura (Bliss, 1883); photographed at Leadsman Shoal by Dennis King; previously known in the Western Indian Ocean only from Mauritius and Réunion; also reported from the western Pacific. 18. Yellowfin damsefish, Chromis leucura Gilbert, 1905; collected at Sodwana and photographed at Leadsman Shoal by Dennis King; previously known in the Western Indian Ocean only from the Maldives, Mauritius and Réunion; also recorded from the western-central Pacific. 19. Yellow-belly wrasse, Anampses twistii Bleeker, 1856; identified at Sodwana by Sally and Dennis Polack; reported from Chagos, Maldives and Indonesia. 20. Half-banded wrasse, Paracheilinus hemitaeniatus Randall & Harmelin-Vivien, 1977; photographed off Park Rynie by Dennis King; not reported since original description of specimens from Madagascar. 21. Cheek-bar wrasse, Pteragogus taeniops (Peters, 1855); collected at Aliwal Shoal, previously known from Inhaca, Mozambique to Zanzibar. 22. Scarlet-spotted blenny, Cirripectes stigmaticus Strasburg & Schultz, 1953; photographed at Sodwana by Dennis King, previously known from Mozambique and the Pacific. 23. Spotty blenny, Laiphognathus multimaculatus Smith, 1955; collected at Aliwal, previously known from Inhaca to New Guinea and Solomon Ids. 24. Rough-head triplefin, Norfolkia brachylepis (Schultz, 1960), collected at Aliwal; previously known from Red Sea and Indo-Pacific. 25. Long snout hawkfish, Cirrhitichthys guichenoti (Sauvage, 1880); collected at Aliwal Shoal; previously known from only 4 specimens caught at Mauritius and Réunion. 26. Brick goby, Priolepis inhaca (Smith, 1949) collected at Aliwal; previously known from Inhaca Id. 27. Curious wormfish, Gunnelichthys curiosus, collected at Aliwal Shoal; previously: Seychelles and Japan. 28. Squaretail rabbitfish, Siganus luridus (Rüppell, 1829); photo by Dennis King at Aliwal; previously known from Indo-West Pacific region, south to Beira, Mozambique. 29. Tyler’s toby, Canthigaster tyleri; collected at Aliwal Shoal, previously known from Mauritius. 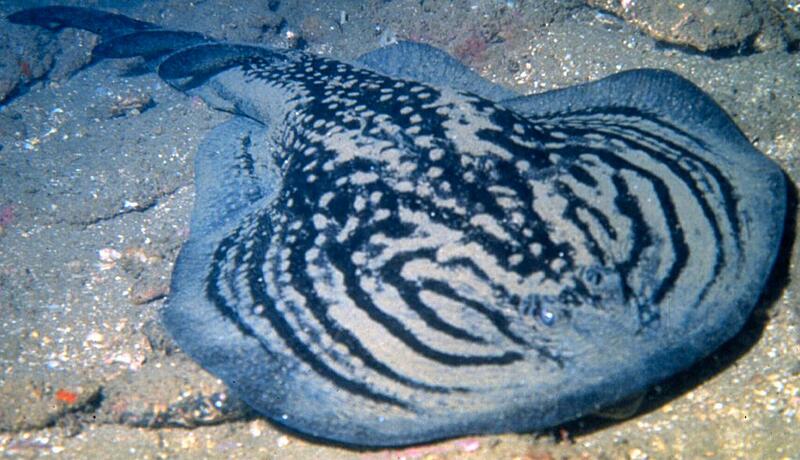 Bluespotted stingray, Dasyatis kuhlii (Müller & Henle, 1841); spotted at Aliwal Shoal by Roel Jonkman. 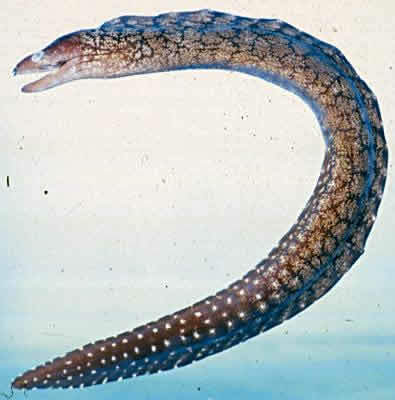 Lattice-tail moray, Gymnothorax buroensis (Bleeker, 1857). Doubleline clingfish, Lepadichthys lineatus Briggs, 1966. 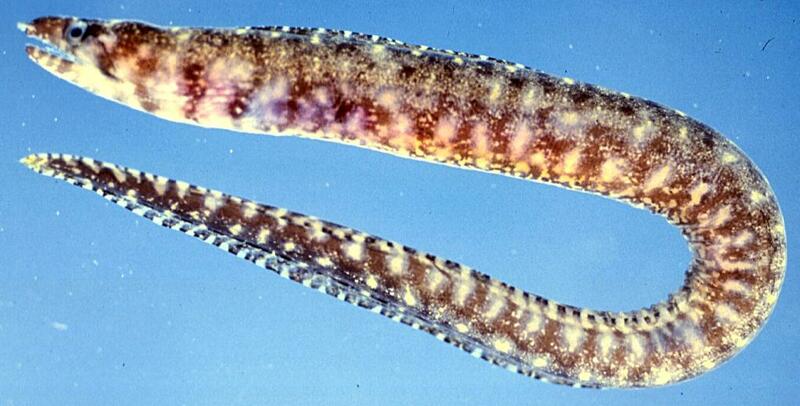 Roughridge pipefish, Cosmocampus banneri (Herald & Randall, 1972). Decoy scorpionfish, Iracundus signifer Jordan & Evermann, 1903. 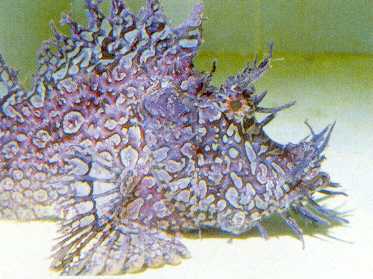 Ocellated scorpionfish, Parascorpaena mcadamsi (Fowler, 1938). Popeyed scorpionfish, Rhinopias frondosa (Günther, 1891). 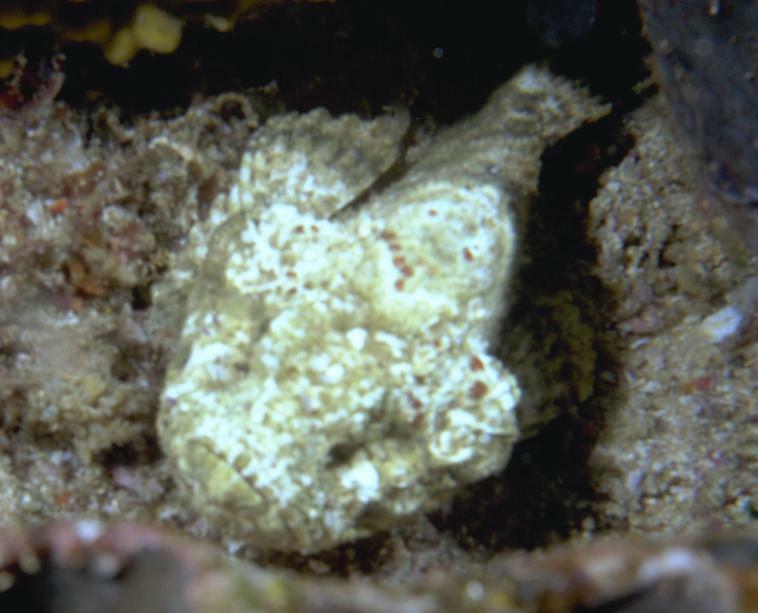 Stonefish, Synanceia verrucosa Bloch & Schneider, 1801; photo by Piet Strauss. Duskyfin rockcod, Cephalopholis nigripinnis (Valenciennes, 1828). Foursaddle rockcod, Epinephelus spilotoceps Schultz, 1953. Honeycomb podge, Pseudogramma polyacanthum (Bleeker, 1856). Dutoiti, Pseudochromis dutoiti Smith, 1955. Broadstriped cardinalfish, Apogon angustatus (Smith & Radcliffe, 1911). Bluebridle cardinalfish, Apogon apogonides (Bleeker, 1856). Ruby cardinalfish, Apogon coccineus Rüppell, 1838. Oddscale cardinalfish, Apogon evermanni Jordan & Snyder, 1904; previously photographed at Hibberdene by Dennis King. Spur-cheek cardinalfish, Apogon fraenatus Valenciennes,1832. Longnose butterflyfish, Forcipiger flavissimus Jordan & McGregor, 1896. 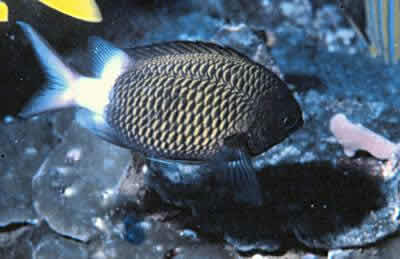 Dusky damselfish, Abudefduf notatus (Day, 1869); collected at Clansthal. Twospot hawkfish, Amblycirrhitus bimacula (Jenkins, 1903). Lined tamarin, Anampses lineatus Randall, 1972; collected at Protea Bank. Saddleback hogfish, Bodianus bilunulatus (Lacepède, 1801); collected at Margate. 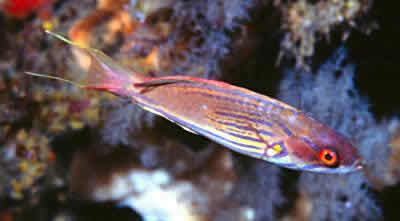 Snooty wrasse, Cheilinus oxycephalus Bleeker, 1853. 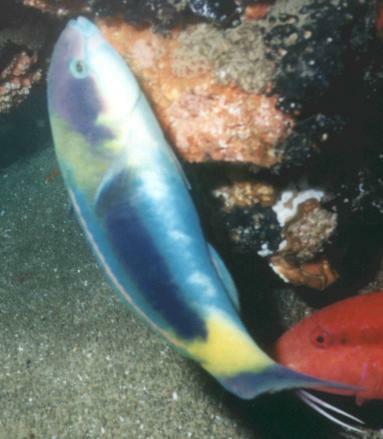 Bird wrasse, Gomphosus caeruleus Lacepède, 1801. Divided wrasse, Macropharyngodon bipartitus Smith, 1957. Two-spot wrasse, Oxycheilinus bimaculatus (Valenciennes, 1840). Muzzled rockskipper, Cirripectes castaneus (Valenciennes, 1836); collected at Clansthal. Yellow triplefin, Enneapterygius abeli (Klausewitz, 1960). Blotched triplefin, Enneapterygius ventermaculus Holleman, 1982. 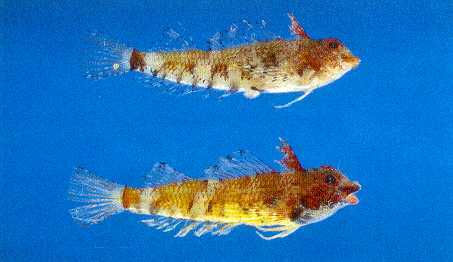 Twospot goby, Coryphopterus duospilus (Hoese & Reader, 1985). 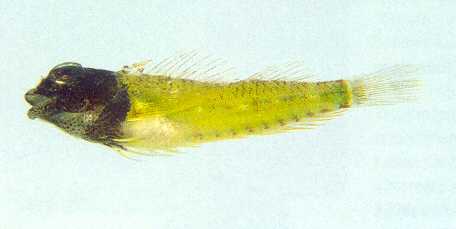 Longspine goby, Coryphopterus longispinus Goren, 1978. Greenbubble goby, Eviota prasina (Klunzinger, 1871). Goldspot goby, Gnatholepis cauerensis (Bleeker, 1853); known from Sodwana as “Gnatholepis sp. 2". Locusthead goby, Hetereleotris tentaculata (Smith, 1958). Toothy goby, Pleurosyciia mossambica Smith, 1959. Bluebanded surgeon, Acanthurus lineatus (Linnaeus, 1758); collected at Clansthal. Elongate surgeon, Acanthurus mata (Cuvier, 1829). Orangestriped triggerfish, Balistapus undulatus (Mungo Park, 1797); spotted at Aliwal Shoal. 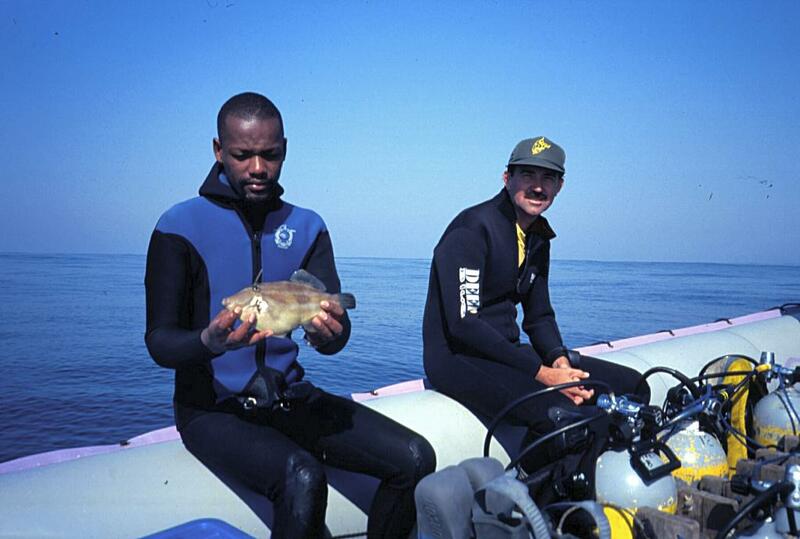 Threespot flounder, Samariscus triocellatus Woods, 1966; picked up by John Dives of KZN Wildlife on fish collecting dive at Aliwal Shoal. Indian triggerfish, Melichthys indicus Randall & Klausewitz, 1973. Spotted toby, Canthigaster amboinensis (Bleeker, 1865). Starry dragonet, Synchiropus stellatus Smith, 1963; collected at Protea Banks. The rare sandy filefish, Thamnaconus arenaceus, was caught by novice diver and Rhodes student, Ntobeko Bacela on a fish collection dive at Aliwal Shoal. Ntobeka’s fish is only the fourth known specimen of this rare species, and the 2nd specimen to be found in South African waters. The live colours of the sandy filefish were previously unknown. Whitespotted electric ray, Narcine sp., this electric ray appears to be new (undescribed); it was recently photographed north of Durban by Dennis King. It was first recorded from South Africa by Stefania Lamberti’s photo of a specimen on Protea Banks. The blackcap wrasse, Thalassoma genivittatum (Valenciennes, 1839), was previously known only from Aliwal and the Mascarene Islands (Mauritius & Réunion), but Piet Strauss recently gave us a photo that he took at Ponta do Ouro, Mozambique. The grass klipfish, Pavoclinus graminis is usually found in weed in tidepools; we collected it at 27 m on Deep Cracker Reef at Aliwal.